Company: Airbus Defense and Space. The A330MRTTs are build as 'standard' A330 at Toulouse and after completing the flight test program are flown to Getafe at Madrid, Spain were the aircraft are converted to MRTT. 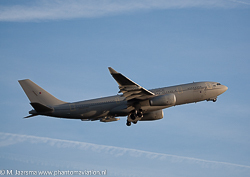 First A330MRTT to be delivered to the NATO MFF program. France: received its first A330MRTT "Phenix" on September 28. Singapore: Singapore received its first aircraft in August, its second was delivered in September. South Korea: Its first aircraft will be delivered in the fourth quarter. The original order consisted of five A330MRTTs designated KC-30A within the Royal Australian Air Force. Two more aircraft were ordered of which one will be configured as VIP aircraft used to transport the Australian prime minister. These last two were acquired from civil airliner Qantas and flown to the Airbus D&S production plant at Getafe in Spain where they will be converted to KC-30A standard. The sixth KC-30A was delivered to the Royal Australian Air Force Base Amberley on September 1, 2017. The seventh aircraft will be delivered in 2019 and will feature the VIP interior. The minister of defense, Mr. S. van de Put, announced on December 22, 2017 that Belgium will join the NATO Multinational Multi Role Tanker Transport Fleet. A contract for one aircraft has to be signed resulting in a total of eight aircraft to be operated by NATO on behalf of the MMF members. France committed to order 12 A330MRTTS. These are ordered in three batches, see table. Ord. 1 Ord. 2 Ord. 3 Opt. Tot. Order 2: 15.12.2015 (one aircraft to be delivered in 2019). The French MoD / Air Force plan to purchase 15 A330MRTTs known as Phénix. These will replace the current fleet of A310s (3), A340s (2), C-135FR (11) and KC-135RG (3). 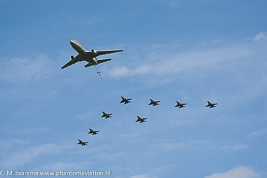 The Netherlands was the lead nation in the European MRTT project which is now known as the NATO Multinational Multi Role Tanker Transport Fleet (MMF) program. As the aircraft will be registered in the Dutch military aviation register the NATO - MFF aircraft are reported as The Netherlands. Aircraft will be designated KC-30 and receive serials M-001 and further. Country Ord. 1 Ord. 2 Ord. 3 Opt. Tot. Order 3: Contract signed on March 1, 2018. Order 2: Contract signed on September 25, 2017 (see comment). Order 1: Contract signed on July 28, 2016. The contract to purchase two aircraft was signed on Thursday July 28th, 2016 with. 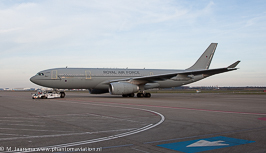 Both A330MRTT will join a pool after delivery which will be owned by NATO. The contract is a result of a European Defence Agency (EDA) program lead by The Netherlands. Luxembourg and Netherlands are the first countries to purchase these aircraft having signed a Memorandum of Understanding to operate the MRTTs. On September 25, 2017 a contract was signed for five A330MRTTs. The order follows the MoU signed on June 29 with Germany and Norway joining the European / NATO Multinational Multi Role Tanker Transport Fleet (MMF) program. Additionally the contract includes four option which could bring the total order to 11 aircraft (originally eight) to enable other countries to join the MMF program. On Thursday June 29, 2017 the Dutch MoD announced that both Germany and Norway will sign the MoU at the minister of defense meeting at NATO in Brussels. With the joining of both countries another five aircraft will be ordered. Of the seven aircraft four will be based at Eindhoven and three in Germany. 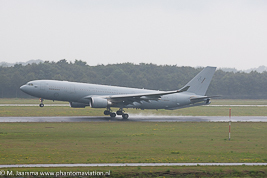 At Eindhoven 334 squadron currently operates two KDC-10 aircraft, at Cologne the BMVg operates four A310MRTTs as well as one A310 in the transport role. The BMVg currently operates from Cologne but by the time the A330MRTTs are delivered will most likely have transferred its operations to Berlin. Belgium announced on December 22, 2017 to join the program which will lead to one aircraft to be ordered. It's expected that the contract will be signed in the first quarter of 2018. The Memorandum of Understanding with the partner nations was signed on February 14, 2018. The contract provides for three options to be converted to a contract when one or more countries join the MMF program. Two countries were named as potential members, the Czech Republic and Spain. The later is known to have an interest in the A330MRTT which should replace the B-707 tankers with have already been withdrawn from service. Aircraft numbers operated by the RAF can change depending on the operational need. Aircraft not needed by the RAF are operated by Airtanker. RAF operated Voyagers (core fleet) are flown on the Military Aircraft Register (MAR). The other aircraft fly on the Civilian Aircraft Register (CAR). The five Voyager KC.2s form the surge fleet and are at the disposal of the RAF when needed. One of the Royal Air Force Voyagers KC.3s received modifications to fulfil the VIP transport role. The Strategic Defence and Security Review 2015 published on November 23rd, 2015 announced the conversion of a Voyager. The aircraft will transport the British prime minister and members of the government. Both India and Qatar expressed an interest in the A330MRTT for six and two aircraft respectively. Royal Australian Air Force KC-30A arriving at Eindhoven air base in 2014. Royal Air Force Voyager KC2 pushed back at Schiphol. Royal Air Force Voyager KC2 departing Schiphol International Airport in 2015.